What is Electrical and Electronics Engineering? 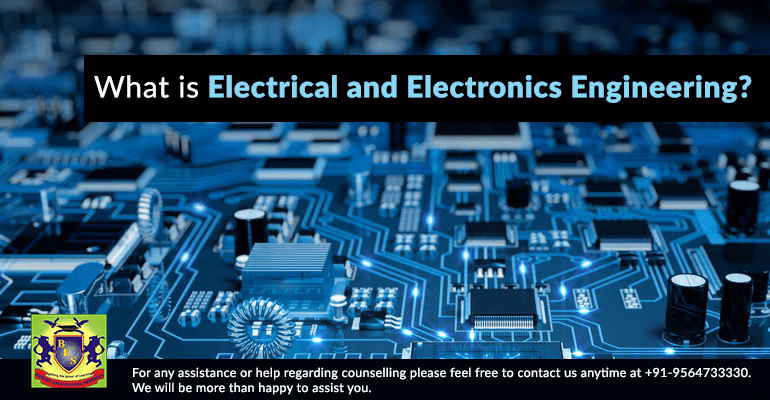 Electrical and Electronics Engineering is a mixture of two branches-electrical & electronics engineering. While electrical engineering deals predominantly with high voltage part, electronics engineering is low voltage part. For that matter, some sections of electronics are familiar with electrical in most competitive examinations. So, let us look at branch combined. – The electrical job sector is limited mainly to government field, and therefore, one should not expect on- campus placement for the same, unless from NIT/IIT. – Also, the courses are tougher because one cannot see flux or field. It’s more of a case of imagination. – An electrical field is the one requiring considerable use of maths in most of the subjects. So, if you not comfortable with maths subject, do not take the fields. However, a person with more interest in maths subject & rather good ideas will enjoy this field a lot. To follow it, take science with maths subjects at 10+2 level and apply for an engineering exam. During counselling procedure that takes place after the results, opt for EEE. In few Universities, only Electrical Engineering course is available. There is a variety of hardly 2 to 3 subjects, though EEE provides excellent results if one wants to work in private sectors. But, in government sectors, both are equivalent. These are subjects one may be expected to study. Electrical machines, Power Electronics, & Power Systems form the core of this field. Rest subjects are regular subjects of EEE (Electronics and Electrical Engineering) & ECE (Electronics and Communications Engineering) found in almost all colleges. Minor variations exist across a Universities. Electrical Machines: It is fundamentally regarding how motor & generator worked. As both motor & generator are almost similar, they are called cumulatively referred to as devices. There are various types of devices- mainly DC, AC and Induction. A transformer is not precisely a machine but, is considered along with them due to similar concepts and conversion used. Power System: If a device is regarding generating electricity, the power system is all about transmitting it. Often the demand & supply of electric energy is kilometres apart. How to transmit it & regulate it during transmission is a concept of the power system. Usually, its concept is interlaced with machines & power electronics. Analog Electronics: If power electronics is regarding high voltage, Analog electronics is regarding lower voltages. Machines are different, and it is one of the most extended subjects with relatively important in the electrical field. Power Electronics: It is regarding regulating the electricity at the consumer end. The process of high voltage conversion of the rate of KW (Kilowatts) or MW (Megawatts). Such high conversions require highly specific equipment & processes that are a section of the syllabus. Control systems: It deals with the general control of various phenomenon. The basic subject is not complete of usage, but extending concepts, different job markets are there. They are commonly used in robotics. EMT: Electromagnetic Theory is fundamentally about wave propagation in media. One has to extend concepts of Class 10+1 and 10+2 to get the flavor of this subject. Microprocessor: The only basic processor of 8085 is educated in most of the colleges that are outdated and hence, not used in all the industries. However, 8085 is the basic microprocessor, & due to its variation, new processors have been designed. Also Read APPSC Mains 2018 To Be Conducted Amidst Protests! The job opportunities are essentially, but not limited to the government sector. All the states have their transmission and distribution utilities. They organise their particular exams for the recruitment of electrical engineers. The generating stations are essentially under the Central Government & their undertakings like NTPC, POSOCO, etc. While most PSUs recruit through the GATE exam, some also organise their exams. Another opportunity involves the ESE conducted by UPSC. It is a three-tier exam, and by clearing it, one becomes an IES officer. It is the Group A service, with similar pay & perks or IPS, IAS, IFS and other such officers. If interested in the private sector, it too has a fair share of companies like Siemens, L&T, Schneider, & General Electric. Their enrollments are limited essentially to IITs/ NITs & some top-level state engineering colleges. So, one cannot be extremely dependent on them. Also Read Top Courses to Study in Switzerland that you Never Miss! – For India, one should attempt GATE. This exam is used by all the IITs & IISc for admission to Masters. IIT (Indian Institute of Technology) Graduates having over 8 CGPA are exempt from GATE Exam. They have to appear in the interview.